Interior Collections was incorporated in 1985. 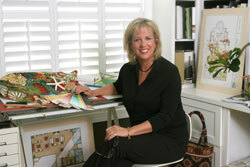 Designer and current owner Mary Beth McKeever worked for the company from 1990–1998 and then moved to Maryland. Upon her return to the Carolina coast in 2008 she purchased the company in order to better serve the area's residents and homeowners. Mary Beth McKeever, a native of Washington, DC and Onslow County, NC has had a love for interior design and Coastal North Carolina all of her life. She acquired her BS degree in Interior Design at the University of Maryland and is a professional member of the American Society of Interior Design (ASID) and the National Certification of Interior Design Qualification (NCIDQ). Additionally, over the years she has taken classes in architecture, feng shui, chakrachology, color and AutoCad, a program that creates computer aided drafting. In 1989, Mary Beth moved to Topsail Island and shortly began working with Suzanne Alexander and Connie Yow as a senior designer for Interior Collections, where she spent almost ten years designing residential and commercial properties (new construction and renovations). She returned to the Washington, DC area in 1999 to work for a high-end design firm and had numerous projects on Park Avenue (New York) and in Potomac (Maryland). Still, while in the DC area, she accepted a position as Senior Designer in the commercial division of Builders Design, Inc., a design firm who had achieved national recognition for their interior design innovation in senior living communities. There she specialized in designing public spaces including club houses, fitness centers, design centers and reception areas, all with an emphasis on universal design. After many years of traveling from New York to South Carolina designing and managing large projects for Builders Design, Mary Beth was drawn back to Topsail Island and in 2008 purchased Interior Collections, Inc.
Mary Beth is dedicated to the integrity of the interior design profession and strives to provide a sustainable design for each of her clients. She has a great eye for color, balance, proportion and detail and in addition to her work with homeowners on new construction projects, has created a specialty design business in renovations for every type and style of home from the one on the beach rental market to the luxury homes found up and down the Coast. Having a love for the environment, Mary Beth 'goes green' whenever a project can accommodate this, and loves to incorporate the feel of the coast and the history of this area in her design. With more than ten years of experience in this area, Mary Beth has developed relationships with numerous quality builders and tradesman that the Topsail Island area is so lucky to have. She is a member of the Surf City Beautification Committee and is an interior designer for a charity in Wilmington, NC known as “Welcome Home Angel,” an organization which provides extreme makeovers for underprivileged children who have serious illnesses or injuries. One of her projects was for an eleven year old girl with Leukemia. This project created the bedroom of the little girl's dreams which was important as the child's bedroom had become her isolation room after her bone marrow transplant. Interior Collections has over the years collected an array of vendors that can blend any style, quality and value that their clients may desire and Mary Beth has the talent, knowledge and vast resources to accomplish the design which will accommodate her client's specific needs. Suzanne Alexander, a native of High Point, NC has had a life-long affair with Eastern North Carolina and the Atlantic Ocean. A graduate of East Carolina University, majoring in Interior Design, Suzanne began her career as a set designer for The Alderman Company in High Point, NC, known as 'the furniture capital of the world'. It was there that she learned how to create space that drew attention to the various elements and products in the sets that appeared in publications and magazines nationwide. In 1982, Suzanne relocated to Topsail Beach and opened Interior Collections, a retail design business specializing in coastal and high-end homes in Southeastern North Carolina, which she sold to Mary Beth McKeever in 2008. Her knowledge of space and in her designs has won her repeated business over the 25 years she has served the Topsail Island and Coastal North Carolina Communities. 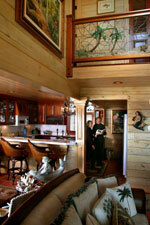 Having a long history with the best builders, craftsman and tradesmen of the area makes Suzanne and her skills sought after by long-timers in the area as well as those who have only recently discovered the beauty of Topsail Island. Over the years, Suzanne has had clients as far away as Texas, New York and Colorado, as well as many cities in NC and continues to serve those clients today. In addition to her interior design consulting, Suzanne is co-owner of Sears Landing Grill and Boat Docks in Surf City, NC, a year-round restaurant accessible by boat from the Intracoastal Waterway or by car. Sears Landing Grill offers breakfast, lunch, dinner, and the Swing Bridge Bar; serving delicious seafood specialties with a West Indies flair. Together working with Mary Beth, Interior Collections, Inc. continues its fine history of offering the best interior design for the smallest of the small projects to the largest of the large projects that Eastern North Carolina has. With over 50 years of design experience, much of which has been on Topsail Island, both existing and new clients can be assured of getting the best quality products, and the best design, for the best price. No one does it better than Interior Collections, Inc.